An American student delegation from Columbia University’s School of Public and International Affairs visited Yunnan University (YNU) on Jan 8, to discuss furthering links between the two education providers. 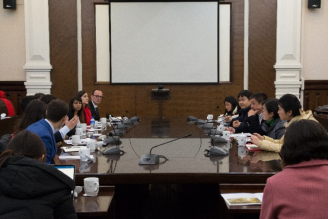 They met with representatives from YNU’s Institute for International Relations and took part in a meeting chaired by Shen Yun, deputy director of the university’s department of international cooperation and exchanges. A number of YNU students and researchers took part in the meeting. Shen began the meeting with a warm welcome to the visiting guests, and went on to introduce the history of YNU as well as the university’s achievements in recent years. Following her address, a discussion was held on a number of topics, with issues debated ranging from China’s foreign policy and economic growth, to problems in the Middle East and the ongoing US-China trade conflict. Deputy researchers Liu Xuejun and Zhu Xianghui commented on the matters raised and answered some of the questions posed by the students. The two groups also exchanged opinions on other issues such as relations between China and countries in Southeast Asia; China’s influence on its neighbors in the context of the Belt and Road Initiative, as well as strictly academic issues such as designing curriculums and developing disciplines. During the meeting, members of both sides expressed their intentions to maintain and strengthen their exchanges. Following the conclusion of the meeting, the American delegation and YNU representatives exchanged souvenirs. Columbia University was founded in 1754 as King's College by the royal charter of King George II of England. It is the oldest institution of higher learning in the state of New York and the fifth oldest in the United States. The School of International and Public Affairs at Columbia University is one of the world’s most prominent schools of international relations.